Help! I Want To Do Trim Healthy Mama, But I’m Overwhelmed! Help! I want to do Trim Healthy Mama, but I’m overwhelmed! Can you help me understand it? How is this exciting? It tells me that people are taking their health seriously. It’s a wonderful thing when people begin to treat their bodies as the temple in which the Holy Spirit dwells. From eternity, the Lord has all of our days numbered and we cannot surprise Him with an additional second by choosing to eat better; but, we can use our life on earth to serve Him with the energy, clarity, and joy that caring for our bodies affords. I think the overwhelming feeling people get when they look into Trim Healthy Mama is largely due to the impending lifestyle change. We like the comfort and stability of our routines, but sometimes we become too comfortable with unhealthy eating habits and it shows in our waistline, energy levels, hormones, and even our mental health. Unfortunately, there is no easy answer if “easy” means continuing to do the same thing and expecting different results. Power to change starts with the mind; if you truly want to be a Trim Healthy Mama, you need to be willing to give some things up…but I promise you’ll gain a whole lot more (and I’m not talking pounds). …these are the things hundreds of thousands of women have gained by adopting the Trim Healthy Mama lifestyle, myself included, and we’ve done it while enjoying from all the food groups, and healthy versions of all our favorite meals that certainly don’t taste like diet food. Cheesecake? Chicken Wings? Tiramisu? Yep, we eat it all! If you’re sick and tired of being sick and tired, and serious about getting healthy for life, I want to offer you a simplified explanation of Trim Healthy Mama, on the condition that you’ll buy the Trim Healthy Mama Plan (or borrow it from the library if finances are tight! ), and allow yourself 5-10 minutes of devotion to the most thorough explanation of the plan, written of course by Serene and Pearl themselves. Keep a highlighter and a notebook handy, and read it word for word. You owe yourself the best explanation of THM. Below is just my personal summary of this sustainable, healthy lifestyle based on biblical principles and backed by science that has helped me discover what Food Freedom really is and rediscover my love of cooking. First, let’s take a look at what Trim Healthy Mama is NOT. Trim Healthy Mama is not a quick weight loss program. You might finder faster, more immediate results with another program, but if you’re looking for life long trim, THM offers that with principles you can apply any time, anywhere. Trim Healthy Mama is not expensive. You can eat on plan very frugally using only foods that you grow or can purchase locally, or you can invest in the wide variety of specialty ingredients found online or in health food stores. The plan is completely doable on any budget. It’s as expensive as you make it. Trim Healthy Mama does not require the use of special ingredients. By “special ingredients,” I mean things you can’t find locally. Even here in Canada, I can find every single ingredient for all of the recipes on this blog in my own town. Trim Healthy Mama is not just for Mamas. Countless men and children are enjoying the THM way of life too. What makes this plan special is that it’s adaptable to pregnant, nursing, and menopausal women and has proven to work and even eradicate female related health issues such as PCOS, endometriosis, and menstrual irregularities, etc. Trim Healthy Mama was created by two busy mothers with the goal of helping other mothers become healthy and strong for their families like God created them to be. As a result, whole families are benefiting from physical and mental improvements in the Queen of her home, and even more so if they participate in the THM meals she prepares. Now, how does Trim Healthy Mama work? What do you have to do? Remember, this is meant to be a lifestyle. Please don’t view it as something you have to do; it’s something you get to do! You get to eat fat! You get to eat carbs! You get to get healthy! This is a blessing, a gift! You’re about to learn a few principles that will equip you to loose or maintain your weight and heal your body from the inside out for the rest of your life. You can do this in any place, any time, on any budget. Ready? Choose good fats (S’s) or good carbs (E’s) for each meal. Do not eat both together unless you’re pregnant, nursing, or need to gain weight. Eating both fats and carbs together is called a Crossover. These are excellent meals for growing children and men who have very physical jobs. Fuel Pulls, another term you’ll hear a lot, are meals that have a lean protein source and not enough fat or carbs to be considered either an S or an E. These types of meals can be helpful for stubborn losers who have trouble shedding pounds, but they shouldn’t be eaten too often by those who are at or near goal weight. Always have a source of protein in your meal that fits your fuel type. Fat-based S meals can have a fat-based protein source like beef, cream, nuts, and cheese. Carb-based E meals need a lean protein source like chicken breasts, beans, collagen, broccoli, 0% fat Greek yogurt, egg whites, and 0% fat cottage cheese. Having protein with each meal keeps you feeling full, boots your muscle mass while you shed excess fat, improves your mood by helping to stabilize your blood sugar levels, maintains strong bones, protects your heart, and improves your mental clarity. In other words, it’s a very important part of every meal. No sugar. In addition to cane sugar and its various forms, this includes all other blood sugar-spiking sweeteners like syrups, nectars, and honey (use xylitol, Gentle Sweet, Super Sweet, Erythritol or SweetLeaf Stevia instead). For your E meals, skip refined or empty carbohydrates or starches. No white potatoes, white flour, cornstarch, or rice flours. Choose healthy carbs like fruit, root vegetables, oats, and sprouted grains, etc., pair them with a lean protein source, and don’t combine them with fat. Wait 3 hours between each meal (unless you’re pregnant or nursing; then you can enjoy a meal every 2 hours, if needed). This gives your body enough time to burn through its last fuel source. (Your two fuel sources are fats and carbohydrates). Alternate fuel sources. I eat mainly fat-based meals (S’s), but it’s important to throw a carb-based meal (E’s) in there every once in a while to keep my metabolism guessing and revved up. If you eat too much of one kind of fuel, you may notice a weight-loss stall, gain, or find yourself irritable if you’re not getting enough carbs (especially during PMS). S’s, E’s, XO’s, FP’s, GGMS, DST, MIM, ACV…if you’ve been lurking around the official Trim Healthy Mama Facebook page for a while, you might think learning Trim Healthy Mama is like learning a whole new language, but I promise you it’s not that hard. These are just short-forms or acronyms for popular THM terms. S stands for Satisfying meals. These are fat-based meals, desserts, or snacks that contain protein and fat, but no sugar and little to no carbs or starches. A good example of an S meal would be: bacon, eggs, peppers fried in butter, and a coffee with cream. E stands for Energizing meals. These are carb-based meals, desserts, or snacks that contain a lean source of protein and up to 45 grams of healthy carbs, but no sugar and little to no fat (1 tsp or 5 grams of fat is acceptable). A good example of an E meal would be: grilled chicken breast, roasted root vegetables, and a salad with a vinaigrette dressing. XO stands for Crossover meals. These are meals that contain both fats and carbs. These types of meals are not conducive to weight-loss, but they are wonderful options for men who have physically taxing jobs, growing children, and can be enjoyed as a treat by those who have reached their desired weight and are in maintenance mode. A good example of a Crossover meal would be: A sandwich made of heavily buttered sprouted bread, a smear of mayo and mustard, sliced meat, cheese, lettuce, and tomato. FP stands for Fuel Pull meals. Fuel Pulls are meals that contain a lean source of protein (the same as you would find in an E meal), and very little fat or carbs. A good example of a Fuel Pull snack would be the Cottage Berry Whip on page 374 of the Trim Healthy Mama Cookbook, made by blending a low-fat cottage cheese, frozen berries, and on-plan sweetener together. SH stand for S Helper. These meals are S meals with a enough carbs in them to push the meal out of S mode, but not enough carbs to be considered a Crossover. These types of meals aren’t talked about as often since they’re more frequently utilized by diabetics and the same people who benefit from Crossovers. A good example of an S Helper would be grilled steak, broccoli with cheese sauce and 1/4 cup of brown rice. ACV stands for apple cider vinegar, the main ingredient in one of Trim Healthy Mama’s most famous drinks, the Good Girl Moonshine. GGMS stands for Good Girl Moonshine. This is a delicious non-alcoholic, drink with numerous health benefits (improves digestion, clear up skin, boosts the metabolism, gives you energy, etc.) that my husband and I enjoy every single day! I kick myself for waiting so long to try it because I was so put off by the thought of drinking apple cider vinegar! Don’t be like me! GGMS can be made in all kinds of flavors (here’s a great list from MamaShire) and none of them taste anything like ACV. My current favorite is the Shrinking Southern Sweet Tea ‘Shine! DTS stands for Drive Thru Sue. This is a term of endearment for Trim Healthy Mamas who often need to eat on the fly, with little time or ability to prepare their meals at home. The beauty of THM is that Drive Thru Sue’s can still eat on plan at virtually every restaurant! MIM stands for Muffin In A Mug. These are fabulously quick muffins (most of them low-carb) that can be cooked in a mug in just a minute in the microwave. The Volcano Mudslide Muffin from the Trim Healthy Mama Cookbook on page 274 is one of my favorites. It tastes like a molten chocolate lava cake! These are the most popular THM (Trim Healthy Mama 😉 ) acronyms. If you’re wondering about one I haven’t listed here, feel free to ask in the comments. What Do I Need To Get Started on Trim Healthy Mama? As I said before, this is book is a must. There are thousands of free Trim Healthy Mama-friendly recipes online (I’ll list some of the best THM recipe blogs to follow in a bit), but there is only one wonderfully detailed, accurate, humorous, authentic plan, and it’s 100% worth the investment. Edited to add: Since its recent release, I now recommend Trim Healthy Table to start. It contains a summary of the whole plan in the first 3 chapters, along with over 300 recipes to get you started. For a thorough break down of what’s included in each of the 4 Trim Healthy Mama books, please check out this post. For clarification purpose, if you’re just starting out with Trim Healthy Mama, you want the Trim Healthy Mama Plan. If you’re purchasing through Amazon, you may see copies of the original, 600+ page book entitled Trim Healthy Mama: No More Fads, also by Pearl Barrett and Serene Allison. This is an enjoyable read and contains hundreds of wonderful recipes, but the revised edition, Trim Healthy Mama Plan, is much more succinct and simpler to follow. Once you feel you’ve got a good handle on the plan, rewarding yourself with a copy of the original manuscript for reaching a personal goal, is a fun idea, but not a absolutely not necessary to starting the plan. 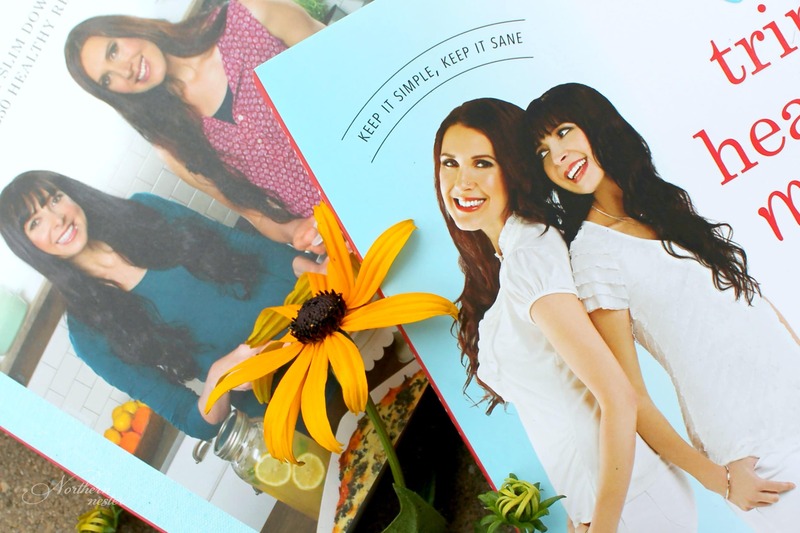 The Trim Healthy Mama Cookbook – this is the first official recipe book published by Pearl Barrett and Serene Allison. Our family has tried and loved almost everything I’ve made from it (currently, my book is permanently opened to the Trimtastic Zucchini Cake recipe, as the kids bring in several cake loads of zucchini from the garden each day!) and the vast majority of the recipes can be made without the use of special ingredients. Trim Healthy Mama’s Trim Healthy Table by Pearl Barrett and Serene Allison. This cookbook isn’t even published yet, but it’s already on Amazon’s best seller list! Coming out in the Fall of this year, Trim Healthy Mama’s Trim Healthy Table is promising to be just as helpful for new and seasoned cooks alike as the first cookbook. It’s on my wishlist! The Poddy podcasts. “The Poddy” is the name of Pearl and Serene’s raw, unfiltered, unedited podcast host by “a guy named Danny.” Every Wednesday, a new Poddy is released. I listen to them on Podbean via Bluetooth during my daily walk, and I cannot even begin to express how much I enjoy getting inside the sisters’ heads. They are a wealth of wisdom, and full of grace, humility, and honesty, with tremendous knowledge regarding physical, spiritual, and mental health. These podcasts are free and I highly, highly recommend listening to them as soon as you can. If you’re still feeling overwhelmed after reading this summary of Trim Healthy Mama, here’s my 4-week NSI (No Special Ingredient) Menu Plan, The Slim And Satisfied Handbook, to help you get started. It contains gluten-free, sugar-free, high-protein recipes for every meal of the day and alternates low-carb and low-fat meals for the optimum metabolism boost. Anything else I should have on hand to start off? Absolutely! Here’s a list of things I use almost everyday to make the Trim Healthy Mama plan work for us. A good blender. I have a Ninja blender, which is a middle-of-the-road choice when it comes to blenders, but it has held up incredibly well during the last 4 years of THM which involved me using it several times a week. Eventually, I’d love to save for a Vitamix! Quality stoneware. I love using stoneware, especially for E meals because it keeps things like baked goods and chicken breasts very moist without any need for additional greasing. My stoneware is from Pampered Chef, but American Bakeware is another excellent brand. A plan-approved sweetener. I use xylitol and SweetLeaf stevia drops almost exclusively. Xylitol tastes the most like sugar, in my opinion, and measures the same, so that makes it easy to convert recipes. It’s harder to dissolve, however, and it’s toxic to dogs, so you want to keep that in mind if you have pets. I use SweetLeaf stevia in my GGMS and Shrinkers. It’s a liquid extract and requires no dissolving. I find it has no after taste when paired with ACV. If I could purchase it locally, Gentle Sweet would be my preferred sweetener, and the one I would recommend to anyone starting out with THM. Erythritol, Pyure, and Stevia are also plan-approved. You can find the Trim Healthy Mama sweetener conversion chart here to help you with conversions. A Mason jar and straw. Some of the THM drinks are so huge, you really do need a Mason jar to enjoy them in! I enjoy all my drinks in my trusty glass jar now. Pantry basics. The following ingredients will help you be able put together a wide variety of recipes. This list excludes “special ingredients,” which I hope to dedicate a different post to another day. Do you have any tips for Beginners? Don’t wait until you have everything figured out before beginning. Start by making one THM-friendly meal at a time, and then make another 3 hours later. You are not a failure if you make Crossover by accident. Every 3 hours you have the opportunity to re-set and start again! Drink at least one GGMS every day. I usually have two. They are so hydrating and life-giving. They help with digestion and will keep you “regular.” Tweak the amount of sweetener and ACV in your moonshine until it’s exactly how you love it, and then drink, drink, drink! S meals are the easiest and, in my opinion, the most delicious. I aim for 2-3 meals a day, and try to eat E snacks, or 1 E meal a day. Just remember to switch up your fuels and not eat too much of one type. Keep your metabolism guessing and enjoy all the food groups! If you give in and eat off-plan, you don’t need to eat 27 cookies just because you ate 3. Your day does not have to end off-plan just because it started off-plan. As the sisters say on The Poddy, practice your comeback! Stick with easy, no-special-ingredient recipes at the beginning. There’s a small learning curve to baking with different flours and sweeteners; we don’t want you giving up on THM just because you’re learning your way around a few new ingredients in some seriously delicious (but a bit complicated) new recipes. Where can I find free, on-plan Trim Healthy Mama recipes? Allow me to introduce you to some of my dear friends and their amazing Trim Healthy Mama-friendly blogs. You’ll have so much fun looking through all the plan-approved dishes they’ve created for us to enjoy! You can find yours truly posting at Northern Nester on Facebook, Instagram, and Pinterest. I hope this was a helpful summary; don’t be shy if you have any questions! Thank you so very much. This is food I would eat. I’m gonna do it! Ty I’m still trying to figure this all out and this has helped! I love this! When I first started THM, it was like a revelation to read that once I cheated, I didn’t have to consider the whole day ruined. Just wait 3 hours and start over! What an eye-opener!! Thank you for your reminders, even for someone who has been doing this for a few years!! What does the drink consist of with vinegar? Wow What a Blessing !! Thank you so much for explaining it where I can understand!! Thank you – your simple explanations have helped me so much! bless you for creating and sharing this. I have bookmarked the page so I can refer back to it often. Jacinda, this is so perfect! Thank you! Sunday night, a day and a half ago, I was looking on your website, and trying to remember you old website, Growing Home, to see if I could find any of the “basics” on THM! I have been playing with THM for several years, and just want to understand the basics and focus on that and building upon it. You seem to have such a grasp on it I came to you website first!! 🙂 This is an answer to prayer!! Wow, Tamara! I’m glad we got to reconnect this way too! 🙂 I knew about this new website and have been following you. I was just trying to remember the name of the older blog and going to check there too! Thank you so much for your help! Thank you! Love that you are tying to help us newbies to be successful! Thank you so much for taking the time to put this together!!! can you make a printable version of this? That’s a great suggestion. I will try to get that done in the near future. Is there a printable version available? Thank you Jacinda! This has been so helpful. I have played with THM for a few years, and can definitely be accused with repeatedly giving up after many failed recipes. I find the meals to be simple to follow, but the baking usually falls flat. Today I’m going to try the zucchini bread you mentioned, since our garden is also overflowing! This was a great read! Thank you for all the great resources and links. I have been playing around with THM since March but I have not been very successful because I am not consistent. I am also still very confused,especially regarding E meals because quite frankly I do not really care for them and I am always starving an hour afterwards! Again, the information you have shared is invaluable! I needed to read this at this exact moment! Just started with the original book (it was all Half Price Books had at the time). Pretty confused, but slowly sorting it out. I have a question about bread. I ran across a high protein bread that is SOOOOO delicious! It has 15 grams of protein, 8 net carbs and 8 grams of fat per slice. Is there a way to work a slice of this bread into a few meals? It’s super expensive, so I won’t be eating often 🙁 but I would indulge occasionally if I knew exactly how. This page was a Godsend! Thanks! A slice of that bread would fit into S mode! The carb limit is 10g. Is there a cleanse that goes with this? Not a cleanse that requires any special purchases. Your body will detox when you cut out sugar sugar though, and sometimes that can mean a few days of irritability and headaches. I’m not a fan of eggs for breakfast. What else can I eat for breakfast? You’re so welcome, Julie! Glad to be of help! FINALLY! Ive been so completely overwhelmed trying to figure everything out and when to eat E meals and S meals, my husband and I are on day 3 and im pretty sure we havent been doing it perfect but well get there! this helped so much, thank you!!! Do you have any idea if you subscribe to the on line membership if all the recipes from their recipe books are on line? I own their first cookbook but not the new one. I’d prefer to subscribe on line and get the recipes. What do you do if you severe reactions to artificial sweeteners? The chuffin pre made mix makes me sick. The blended sweeteners give me horrible stomach problems and headaches. I’m really disappointed. Plz excuse me as I am reaching straight to the point . My qs being, I do not c milk in this plan, but almond , coconut etc. however there is cream , cheese butter etc. kindly explain. Tia. I’m brand new. I bought the original book a few years ago and was so overwhelmed, I put it away. Now, I want to try it, so I bought all the books, but am still concerned about a few things. For instance, 1) using 0% cottage cheese. If it’s 0%, they’ve usually added all sorts of junk to it, the 2% or full fat are pure. Why use the 0% when we’re trying to eat clean? 2) Not eating wheat, I realize it has a high glycemic index, but if it’s in moderation and paired w/protein, what makes it bad? The book says butter is good, Jesus ate it, but he ate wheat too, breaking off the heads as they walked, or w/fish. At the Passover, they ate bread, meat, vegetables and wine together. 3) Soy and tofu, I like it, but there are so many articles saying to stay away from it. 4) Trim baking mix is expensive, and you and the book say you don’t need special ingredients. What can you use instead? 5) Why is it healthier to use ingredients such as xanathan, xylitol or ingredients where you isolate part of the food such as in oat fiber, than use a whole food? 6) Milk is said to have too many carbs, so you are limited to cultured or fermented products. 2% milk has 11 carbs, kefir has 12 carbs. 7) Reddiwhip, why use that instead of whipping cream? Reddi whip contains all sorts of junk including carrageenan and diglycerides. While I am interested in this program, I wonder if it’s too complicated. Some of the ideas I’ve read and the recipes sound good, some sound like “natural” Frankenfood, with all these odd special ingredients. The books say no special ingredients are needed and it’s not expensive, but I see lots of special ingredients, many of which the authors are selling, which is somewhat concerning and the all the additional add-ons and websites, all of which are expensive. I understand this comment will probably be ignored or considered a challenge, but these are my concerns and I doubt I’m the only one who has them. I’m interested in eating clean and losing weight. I’m not interested in being part of someones money-making philosophy business. Great questions – I would like to see the answers as well. THANKS. OK I know this comment is over a year old but I’d like to answer for anyone who comes across this and has the same questions. First things first it’s important to understand the difference between the 2 sisters’ appoaches. Pearl is what THM calls a Drive Thru Sue meaning she doesn’t mind taking a couple less natural “frakenfood” shortcuts such as low carb pitas, fat free reddiwhip, dreamfields pasta and using a microwave. Serene is a Purist meaning she would never use any of the above, she buys pastured raw cheese and loves to use healthy ingredients like boabab, spirulina, and turmeric. Both of these types are welcomed on THM with open arms. You don’t have to be 100% organic, grassfed, never eat at a drive thru to be a THMer but if you’d like and can afford to that’s great, go for it! 1) completly understandable. Buy the 2% that’s what I, and many others do. 2) true Jesus did eat wheat but he ate a very different wheat than what is most available to us today. (I could explain this but I’m trying to keep this message as short as possible) Still wheat isn’t fully banned on THM. Buy sprouted or Eikhorn variety. Most sprouted bread, which is on plan, has sprouted wheat in it. 3) totally up to you. I use a little soy sauce here and there but I’m not a fan of soy and have no desire to eat tofu. If you have a different opinion, again, go for it! 4) if you’re OK not eating S cookies, pies, cakes, muffins etc than you don’t need baking mix. You can still make great E muffins and cakes with oat flour and there’s practically an infinite number of mains and sides that don’t use it. Again up to you. You don’t however need to buy their blend. There are plenty of great DIY mixes available. I make Briana Thomas’ Baking Mix and love it! 6) Milk is high in sugars and not the best for weight loss. Keifer is closer to yogurt and is packed with probiotics. The carb count isn’t the only problem with milk it’s also the lack of nutritional benefits. Raw whole milk can be a good special treat once closer to goal weight. 7) reddiwhip is never encouraged instead of whipping cream. THMers use plenty of cream in rich S meals but cream contains too much fat to be used in an E (in most cases) so if you really wanted whipped topping with your E dessert a small squirt of fat free reddiwhip is allowed for Drive Thru Sue types. Purists never have to use it. I don’t. It’s really not complicated. It might seem to be the first week or 2 but soon it becomes second nature. THM is a very flexible eating plan. If you don’t want to use franken foods don’t use them. If you can’t live without wheat buy sprouted or Eikhorn. If you don’t want to buy the THM brand make your own DIY “gentle sweet” “super sweet” and “baking blend” there are plenty of recipes out there. If you can’t afford special ingredients there’s a whole catogory of recipes, NSI, for you! I am allergic to oats; can I substitute spelt or something else in the them recipes? I think THM is a great lifestyle plan; however, I am allergic to dairy. THM is really dairy heavy. How can one do the plan if allergic to dairy? What can be substituted? I am confused about snacks. Yo said you have an E snack, but does it have to be 3 hours after an S meal? Or visa versa? It stands for Dairy Free. Whey comes from milk whereas collagen comes from the bones. This is all excellent information and it makes me feel empowered. Thank you.